Scattered thunderstorms early, then cloudy skies after midnight. Low 52F. Winds SW at 10 to 20 mph. Chance of rain 60%. 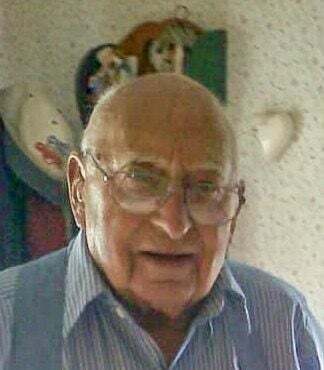 William “Bill” Fritz, age 92, of Buckingham, IL, died on Friday, February 1, 2019 at Amita St. Mary’s Hospital in Kankakee, IL with his family by his bed side. Bill was born on September 11, 1926 to George and Emma (Hebekeuser) Fritz in Buckingham, IL. He married Elsie Roe on June 2, 1949 at St. Margaret Mary Catholic Church in Herscher, IL. He started Fritz Electric, now Fritz Electric & Grandsons, in 1956 in Herscher, IL. He served on the Herscher Fire Department for 40 years, attaining the rank of Assistant Fire Chief. He served as an office of the Herscher Sportsman’s Club and was a member of St. Margaret Mary Catholic Church. He enjoyed watching the Chicago Cubs, Chicago Bears and western movies. He also enjoyed hunting, fishing and snowmobiling. Bill is survived by his wife of 69 years, Elsie Fritz of Buckingham, IL; three daughters, Karen (Jerry) Stam of St. Anne, IL, Mary Kay (Steve Warriner) O’Brien of Wilmington, IL and Alice (Dave) Scott of Gilbert, AZ; nine grandchildren, Tony (Michele) Rattin of Herscher, IL, Glenn (Leticia) Keasey of Lowell, IN, Dana (Julie Berryhill) Rattin of Bonfield, IL, Jerika (Rob) Williamson of Milwaukee, WI, Katie (Doug Warriner) Wiens of Custer Park, IL, Kristin (Josh) Burmeister of Herscher, IL, Lynn (Dane) Lynch of Gilbert, AZ, Chris (Jessica) Norman of Manteno, IL and Jennifer (Ben) Gaballa of Clarksville, TN; nine great-grandchildren with twins due in August; two great-great-grandchildren and siblings, Mardelle Spears of FL, Francis (Ann) Fritz of Kankakee, IL, Edwin Fritz of Kankakee, IL, James (Ann) Fritz of Kankakee and Katherine Lovell of Cincinnati, OH. He was preceded in death by his parents, two brothers-in-law, one sister-in-law and one great-grandson. Visitation was held on Tuesday, February 5, 2019 from 4:00 p.m. until 8:00 p.m. at Schreffler Funeral Homes, Kankakee Chapel. Another vistiation was held on Wednesday, February 6, 2019 from 9:00 a.m. until the time of Bill’s funeral mass at 10:00 a.m. at St. Margaret Mary Catholic Church in Herscher, IL. Burial will immediately follow at Sts. Peter and Paul Cemetery in Bonfield, IL.